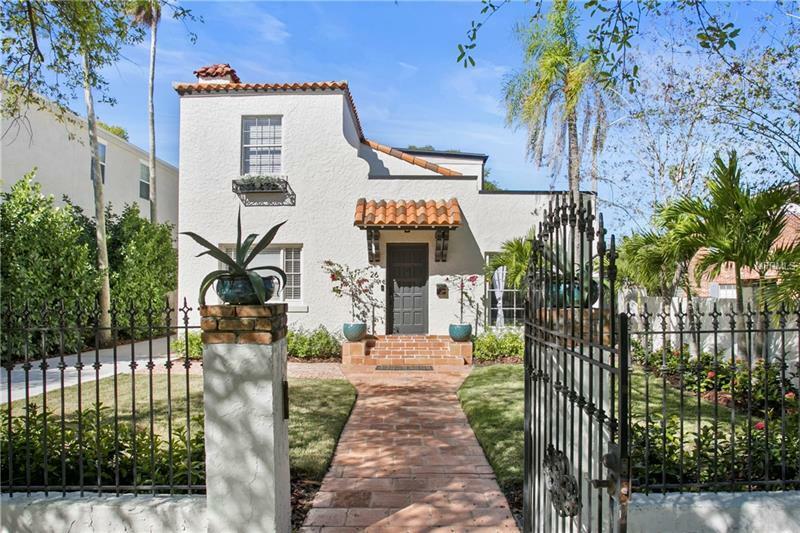 A nod to the past, this 1924 Historic Davis Islands home has been completely renewed and expanded with the utmost attention to detail. A classic Spanish Mediterranean, this two-story home offers hardwood floors throughout and charming details at every turn. A formal living room with fireplace greets you upon entry and flows easily into the formal dining room. An updated kitchen with granite countertops and stainless-steel appliances offers sightlines to the family room which includes a full bath. This space could easily be used as a 4th bedroom for those buyers needing a first-floor bedroom. The first floor also offers an office boasting tons of natural light. Upstairs the spacious master suite features a large walk-in closet and a bath with dual vanities and glass enclosed walk-in shower. The additional two bedrooms are generous sized and offer ample closet space and share a hall bath. Outside is a lovely covered patio space perfect for entertaining and overlooking the privacy fenced yard. Additional amenities include a gated homesite, large 2nd floor laundry with flex space, a 1 car garage and a 1 car carport.